Thoroughbred Interests, Inc. (TBRE) announced on Wednesday, April 7, that it has placed a bid on the Bandera Downs Race Track property, which is located in Bandera, Texas. 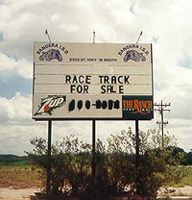 The bid was submitted to the Bandera Independent School District, which currently owns the property, and is contingent on the company being issued a Class Two Racing License by the Texas Racing Commission. The company has started the racing license application process, having requested with the Texas Racing Commission that it be placed on the agenda at the next possible meeting date. The Bandera Independent School District Board of Directors is scheduled to meet next Tuesday, April 13, at which time it will determine which bidder will be awarded the property. Additionally, the company announced that it had attempted to acquire Blue Ribbon Downs in Sallisaw, Oklahoma, in October 2003; the property was ultimately sold to the Choctaw Indian Nation. The company's interest in this property was due to the State of Oklahoma's having recently approved alternative gaming in the form of video lottery terminals at its race tracks, including Blue Ribbon Downs. Thoroughbred Interests is currently seeking gaming and racing licenses, as well as properties, in other locations. Jim D. Tilton, Jr., Chairman, CEO and President of Thoroughbred Interests stated, "We hope to acquire the property and obtain a racing license in order to rebuild and reopen Bandera Downs. The project could be of significant economic benefit to the Bandera area, bringing a direct investment of over $5 million and new jobs, tourism, and tax dollars. Whether or not our bid is successful, we will continue to seek similar opportunities elsewhere. We would like to acquire one or more gaming-type properties in 2004 and are currently evaluating other opportunities." As previously announced, in January 2004 Thoroughbred Interests elected to be regulated as a business development holding company. This will make it easier for Thoroughbred Interests to raise capital. The company also recently announced that Wall Street-based Compass Capital Group has committed to invest $5 million over the next 12 months, and that the company plans to change its name to "Phoenix Interests, Inc.," subject to shareholder approval, so as to better reflect the gaming and entertainment focus it has elected to pursue. Louisville, Kentucky based Thoroughbred Interests, Inc.'s core historical business was acquiring undervalued yearling Thoroughbred horses and reselling them as two-year-olds in training or as a racing prospect. This is commonly referred to in the Thoroughbred industry as "pinhooking". The company is currently looking to expand within the Thoroughbred industry beyond pinhooking activities. The company is also currently implementing new strategic corporate initiatives along with exploring potential acquisition candidates in the gaming, entertainment and other sectors.